This is a sample of our New pre-cut Cascading Card. It has 2 sides that are diagonal tri-folds with slits on the panels, so the 2 panels fit together to make the Cascading Card. Slits are opposite on the 2 different panels, so they interlock. Stamps are from Rubbernecker Stamps. What a fun..festive Christmas Card. I had fun making it! This is one of our Slider Die Cut Cards that I mounted on Red Mirricard and then on a White Steno Card. The first picture is the Slider Die Cut closed. The second picture is after you pull up on the red circle tab to move the slider up to reveal what’s on the inside. The slider die cut is also attached to a folded Steno Card, so you can write a message on the inside of the White Steno Card. This A-2 Box Card pops open to reveal these little Christmas surprises!! You might not want to do 25 or more of these for Christmas cards, but they sure would be fun to give them those special people in your life! The Pop-Up Box Card is pre-die cut in 2 different sizes. The one shown above folds flat into an A-2 size card, but then pops open to make a cute little square box. Don’t forget about our sale…ends this FRIDAY! This cute Square Pop-Up Box Card was a class card that I taught at Creations Galore this past Saturday! We had a fun time making 4 different cards. The Pop-Up Box Card folds flat for mailing (picture on the right) and then pops open into a Box. They are pre-scored and die cut, so they are already to decorate and assemble. <br>The Pop-Up Box cards are also available in an A-2 size. Hark the Herald Angels Sing!! ….is the theme of this card! Yes, I know…haven’t reached Thanksgiving yet, but some may still need Christmas card ideas. 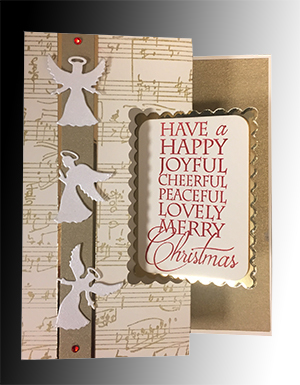 This isn’t a Christmas Card Kit, but our pre-cut Scallop Rectangle Swinging Z Fold Card works perfectly for this card and the work is done for you. The saying fits great on the Rectangle Layers – cut from our Scallop Rectangle Layering Die Set.